Plankton are the minute plants and animals free-floating and suspended in the water column. 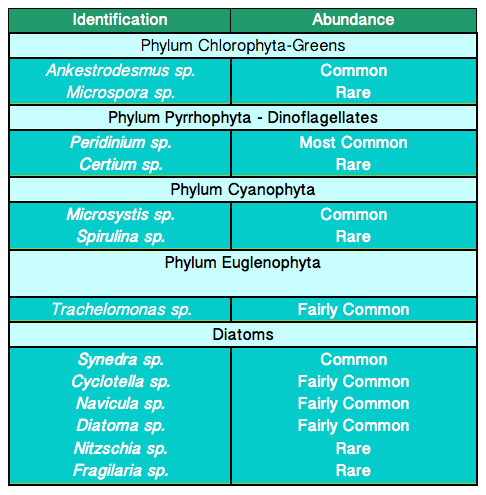 There are two categories of plankton - phytoplankton (plants) and zooplankton (animals). Phytoplankton are the base of the food chain. Zooplankton are primary consumers, feeding on the algae. They in turn are food for small fish. Water bottle samples were used to collect phytoplankton and a Wisconsin Net was used to collect zooplankton. There was no zooplankton found in the samples.